Groups permitted to protest the NATO summit, such as Iraq Veterans Against the War, are pledging nonviolence this weekend, but what concerns police and security consultants are black bloc tactics that could lead to police action. 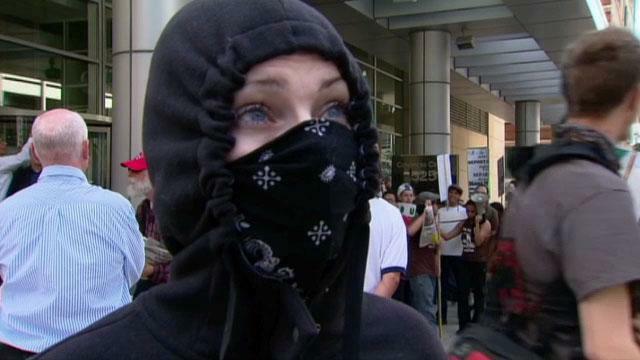 Protesters using black bloc tactics dress almost entirely in black, often covering their face with bandannas or masks to preserve their anonymity. Black blocs, or those that use the tactics, are typically anarchists, and incite violence by destroying property and instigating police. Originally a European protest tactic from the 1970s, black blocs gained prominence in America after the 1999 riots in Seattle during the World Trade Organization conference. One protester at an Occupy Chicago rally Tuesday said to expect black blocs during the NATO summit. Identifying herself only as JR, she said black bloc was a "tactic used by people who do not wish to be identified by the state," and intended "to incite a response." JR also called all property a form of theft and said "all structures owned by banks should be torn down." She did not say whether any banks in particular would be targeted by her or others using black bloc tactics during the summit, but said she had no interest in hurting people. Security consultant Tom Kasza says black bloc is characterized by "destruction and chaos," and that police are ready for black blocs. A common tactic, he says, move in a group and have a single member break out to destroy property. They then rejoin the group for protection and to keep police from identifying them. "It's quick destruction, which forces police action," said Kasza, managing director at security firm Hillard Heintze. "I know police are ready for them." Occupy Chicago spokeswoman Rachel Perotta says she hasn't heard of any planned violent protests, but welcomed any who wanted to join their rallies. "Occupy Chicago is in solidarity with all of the people coming here to protest the NATO war machine," she said. "We’re not making distinctions between good protesters and bad protesters." Coverage of violent protests in Oakland prompted AdBusters, the activist organization behind Occupy Wall Street, to applaud black bloc. "Anarchist occupiers are energized and their visceral tactics are attracting members. Now, the power of the Black Bloc is growing within Occupy and pushing the movement in unexpected directions," the group wrote. But black bloc tactics are divisive within the Occupy movement. Pulitzer Prize-winning journalist and activist Chris Hedges denounced black blocs in a February article, "The Cancer in Occupy." "The presence of Black Bloc anarchists—so named because they dress in black, obscure their faces, move as a unified mass, seek physical confrontations with police and destroy property—is a gift from heaven to the security and surveillance state" because it allows police to paint all protesters as violent, he wrote. "They confuse acts of petty vandalism and a repellent cynicism with revolution." In an interview, Hedges also criticized Occupy Chicago's statement not distinguishing between good and bad protesters. "That's a really stupid comment," he said. "There are tactics that work and tactics that don't." Black blocs marginalize a protest's message and justify excessive police force, according to Hedges. While brutal police action, like the notorious 1968 Democratic convention in Chicago, can tarnish a city's reputation, it's far more powerful to contrast a militarized police with non-violent protests, Hedges says. "What stains the city is when you have non-violent protests, like Birmingham, and you see the dark heart of the police state exposed," he said. That contrast is part of the rational behind clown blocs, a take on black blocs where protesters preserve their anonymity in clown makeup, but replace violence with humor. Clown blocs are already planned for Chicago's NATO summit, according to ClownBloq co-founder José Whelan. "We’re hoping a group of clowns confronting [state and police] violence may more clearly illustrate the absurdity of the violence. After all, we'll be there with silly string and whip [sic] cream pies," he said. Chris Hedges' article describing black bloc as "the cancer of the Occupy movement"